Forget 12″, Fiat does 15-metre. It’s become de rigueur for brands to use records to advertise domestic lifestyle choices that influence your purchase of, well, anything. Becks, First Direct, even Durex, have cashed in on the vinyl revival through marketing, as we explored in-depth here. 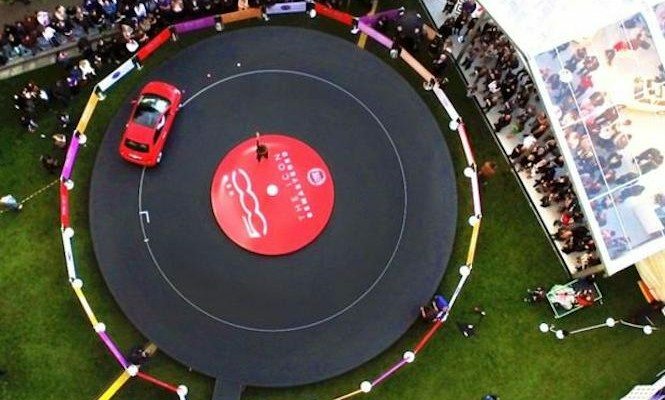 Following in their footsteps, Fiat have just launched their newly ‘re-mastered’ 500 model with a 15 metre-wide vinyl record. The car was driven and reversed around the record, apparently triggering sounds, while Ella Eyre stood in the centre performing Emotions’ “Best Of My Love” to a private audience in London.